A high-density form of plasterboard specifically designed to cut down unwanted noises making their way through both walls and ceilings. With a higher density core than standard plasterboard, Soundboard is ideal for upgrading the acoustic performance of existing walls and ceilings. As with the Vapour Shield, Moisture Resistant Plasterboard is designed to be used in situations where humidity is high. Moisture Resistant Plasterboard is especially suitable for use in kitchens and bathrooms and is easy to score and snap for quick installation. Specifically designed to offer optimal resistance to fire, Fireshield is a high-performance level plasterboard perfect for use in partition, ceiling and lining systems, and can also be used in both encasement and shaftwall systems. It contains small quantities of glass fibre and vermiculite, designed to increase core cohesion at high temperatures. The Standard ivory paper faced plasterboard is an excellent and popular material designed to be used in a wide range of different projects. It’s great value, perfect for use with partitions, linings and ceilings. Plasterboard is easy to score and snap for fast installation. 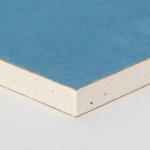 We also sell a wide range of other plasterboards. To find out more, get in touch with us today.